Ingredients: Jack Black, Angelina Jolie, Gary Oldman, Seth Rogen, Jackie Chan, Lucy Liu, David Cross, Dustin Hoffman, James Hong, Michelle Yeoh, Danny McBride, Dennis Haysbert, Jean-Claude Van Damme, Victor Garber and Lauren Tom. Directed by Jennifer Yuh Nelson. Run time: 91 minutes. Rated: PG. At First Bite: Personally, I find Jack Black to be annoying. But, it is much easier to watch one of his movies if he's just a voice actor. 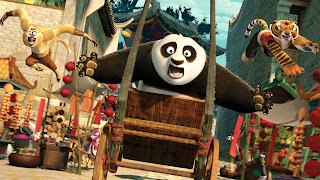 In the first film, Po (Black) was matched up against Tai Lung, who really had a beef with Master Oogway. Here, the story pits Po against someone from his past, Lord Shen, who is bent on killing off Kung Fu altogether and taking over China. Tough to Swallow: I wish I would have seen this in 3D. Something to Chew On: This is the feature directorial debut of Yuh Nelson. To date, KUNG FU PANDA 2 is the highest-grossing film with a female director. Shen was actually a character for the first movie, but was written out before production. Guillermo del Toro is credited as a Creative Consultant. Charlie Kaufman did some uncredited script touch-ups. 2012 Oscar nominee for Best Animated Feature. Aftertaste: Po is still a fanboy of the Furious Five, but he's toned down from the original. And, only one skadoosh. This time Po is more vulnerable. He's haunted by flashes from his past, but he's not sure what they mean. Darker than the first film. Of course, when you have a villain hellbent on killing all the pandas, it's going to be dark. Who hates pandas? I will say Shen doesn't look the part of a bad guy, but having Gary Oldman's voice definitely helps. I love the use of different animating styles. The movie starts and ends with 2D shadow puppetry. The bulk of the movie is 3D CGI, and Po's memories are 2D anime. The dragon sequence and the ensuing chase are my favorite scenes. The final battle is pretty sweet as well though (by that point the movie is sooooo red). There are some really funny moments. I think the one I laughed at most was when Po is flipped by the prison door and turned around by Tigress (Jolie). There are also some tug-at-your-heart ones, especially with Mr. Ping (Hong). I'd say Mr. Ping and the Soothsayer (Yeoh) steal their scenes. Better than the original. Pure awesomeness.